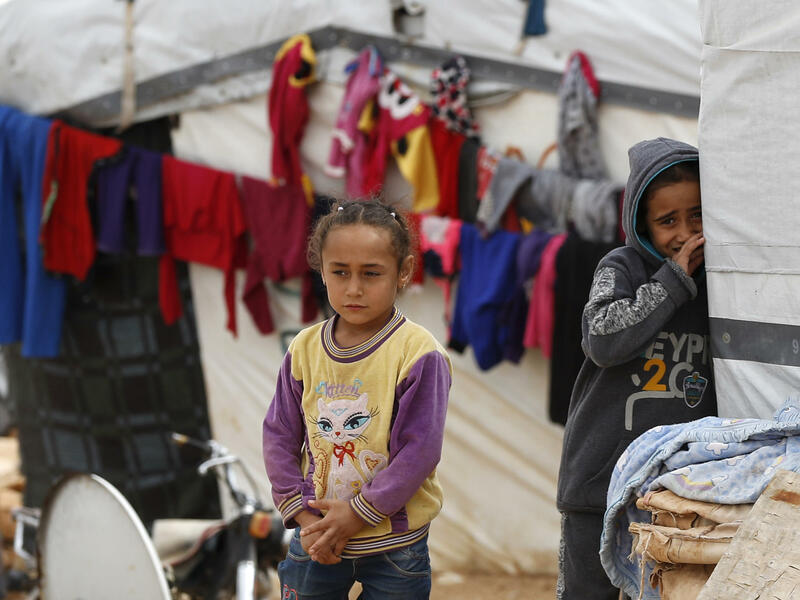 Syrian refugee girls stand outside their tent at a camp near the border with Syria in eastern Lebanon on June 13. The U.S. has admitted 49 Syrian refugees so far in fiscal year 2018. More than 12,000 Syrian refugees were admitted in fiscal 2016, the final year of the Obama administration. In fiscal 2017, which includes the first year of the Trump administration, the number of Syrian arrivals was 6,557. Muslim refugee admissions have dropped by almost 90 percent compared to the 2017 fiscal year, according to a recent report by the Washington, D.C.-based advocacy group Human Rights First. Refugee arrivals to the U.S. from the Middle East and South Asia have dropped by 84 percent compared to 2017, according to the same report. "It is fair to say the refugee program now has a 'Muslim ban' in all but name," says Jennifer Quigley, a refugee advocate with Human Rights First. This year has seen a striking decline in all refugee admissions. At current rates, about 22,000 refugees will have resettled in the U.S. by Sept. 30, the end of the 2018 fiscal year. That is less than half the 2018 cap of 45,000 set by the Trump administration — the lowest ceiling set since Congress created a federal refugee program in 1980. This year's dramatic drop prompted 63 Republican and Democratic members of Congress to deliver a protest letter last week to Homeland Security Secretary Kirstjen Nielsen and Secretary of State Mike Pompeo. In the letter, they note that as of July 9, the U.S. had admitted 16,429 refugees. "We implore you to increase the pace of arrivals for the rest of the fiscal year," they wrote, to meet the 45,000 cap. Separately, refugee advocates fear that Pompeo may do away altogether with the State Department's office devoted to refugees and migration issues. Along with former diplomats and other U.S. officials, advocates wrote him on Monday to warn that doing so "would be an error of grave proportion." The Trump administration began targeting refugee arrivals in the president's first months in office. His executive orders severely restricted refugee flow in 2017. When those orders banning travel from certain countries expired, refugees from 11 countries had to face stiffer security barriers and were required to undergo higher-level security screenings known as Security Advisory Opinions. At the same time, refugee advocates say the security processing for refugees has slowed from hundreds of cases a week to one per day. "Some of those agencies are not processing people to the degree that they used to," says Quigley. "It's political will, it's not the mechanism." The extra vetting procedures make it nearly impossible for refugees from the 11 countries to resettle in the U.S., says Becca Heller with the International Refugee Assistance Project in New York City. "The number of refugees admitted from those countries has dropped to almost zero," says Heller, who observes that the Trump administration "is getting their ban one way or another. If not through an outright ban, then through a thousand paper cuts." The next important date in refugee resettlement comes in September, when the White House will announce a new ceiling for refugee admissions for the next fiscal year, in consultation with Congress, as set out in the Refugee Act of 1980. The numbers for fiscal 2019 are expected to be even lower than for 2018 — a "really dark moment," says Barbara Strack, who, until January, was a senior Department of Homeland Security official overseeing refugee admissions. "I think one likely approach would be to use this year's actual admissions as a benchmark for next year's ceiling," says Strack, "which would put the new ceiling in the 20,000 to 21,000 range." Robert Carey, who led the Department of Health and Human Services Office of Refugee Resettlement during the Obama administration, also believes this year's shortfall in resettlement will become a rationale for a lower ceiling next year. The administration, he believes, wants to run the program into the ground. "I think it's been the intention, if not a stated intention," he says. "The effect has been to manage this program to fail." Dismantling the U.S. refugee resettlement program by reducing the overall resettlement numbers is likely to have consequences that will outlast the Trump administration. Nine nonprofits across the country are federally approved to resettle refugees and receive government funding for each case. As their caseloads shrink, so do their budgets. Diminished resources have already led to staff cuts and the closure of some resettlement offices. "The refugee program is in danger," says Chris George, the executive director of Integrated Refugee and Immigrant Services, a resettlement organization based in New Haven, Conn.
George has pioneered a community program in which private groups volunteer to carry out resettlement work. In the 2017 fiscal year, more than 300 Syrians resettled in Connecticut. "We haven't welcomed a single Syrian family this year," he says. George has been lobbying the federal government for his program to offer services to Central American migrants as well. George points to the tent camps on the U.S.-Mexico border and the private contractors awarded government contracts to house asylum seekers. "Our proposal is to use an existing network," he says. "Asylum families should be placed with us. We have excess capacity. It's going to save the U.S. taxpayer tons of money." What his program offers is "a more humane alternative," he says, "and we can do it at a fraction of the costs."